Vibrant Performance weld bungs are an excellent and convenient way to handle a variety of applications such as aluminum radiators, oil pans, custom tank fabrication or any other project that is specialized and requires customized plumbing. 20 Pack 1/4-20 Spot Weld Nuts - Double Tab Spotweld Nut Material C1010 High-Welding Quality, Low Carbon Steel Plain Finish Welcome to our store. Your satisfaction is our priority. If there are any questions before and after purchase, please welcome to contact us, we will try my best to solve all for you. 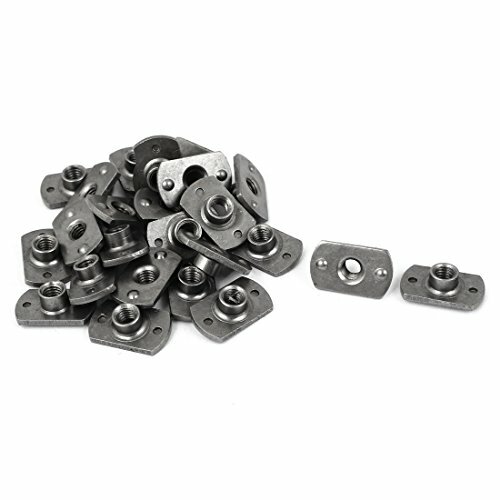 10 Pack 5/16-18 Spot Weld Nuts Single Tab with Target - is a good choice when space limitation is a consideration. 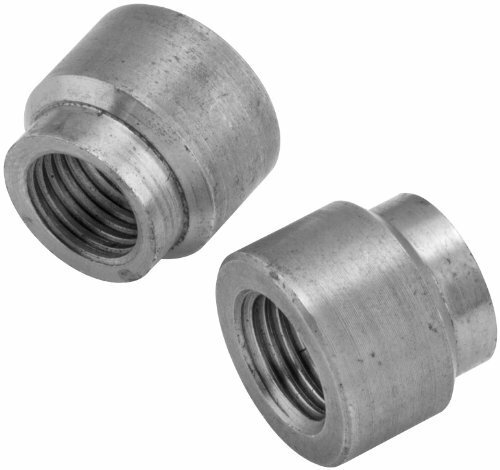 This weld nut has a narrow body that is well suited for use in confined areas. 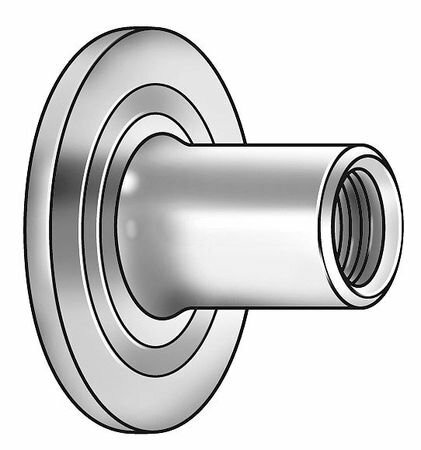 The weld nut features a strong single button projection which gives a deeper, more penetrating weld than is ordinarily obtained from other types of projections. Thread Size 5/16-18 Width (in) 5/8" Thickness (in) 9/64" Length (in) 63/64" Hole In Sheet (in) 0.375 Material C1010 High-Welding Quality, Low Carbon Steel Plain Finish Threads Unified Standard Class 2B ASME B 1.1-2003 Welcome to our store. Your satisfaction is our priority. If there are any questions before and after purchase, please welcome to contact us, we will try my best to solve all for you. 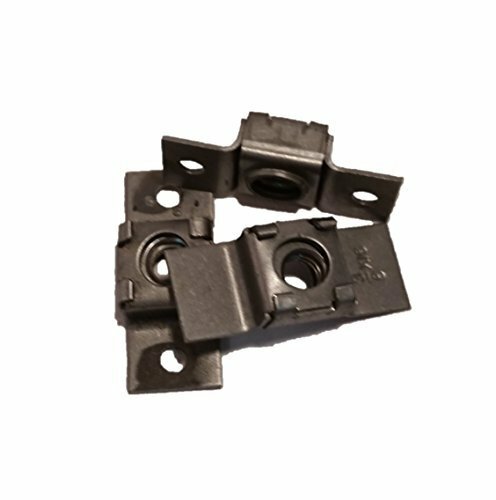 This Tab Spot Weld Nut is a recessed electrode guide greatly facilitates welding to thin materials. It is ideal for use when a self-locating spot-weld nut is needed. 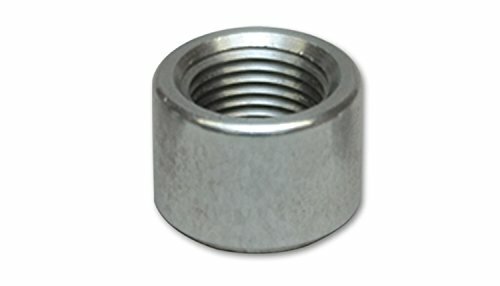 This weld nut can be used in restricted areas such as corners, channels, and other confined areas. 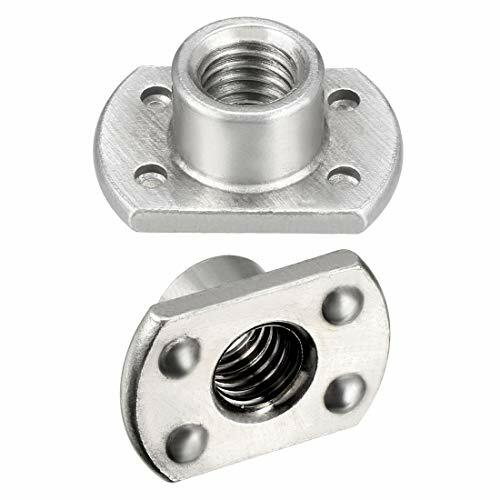 This Tab Spot Weld Nut is extremely versatile and will provide a robust spot weld connection in a wide range of applications and conditions. 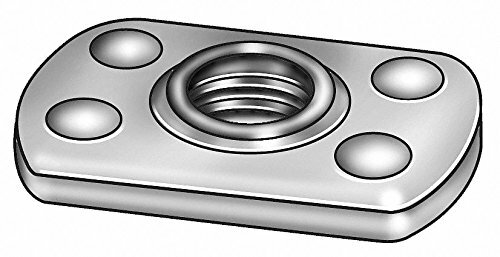 If your product or application has fastener space constraints, you should consider the use of this weld nut. 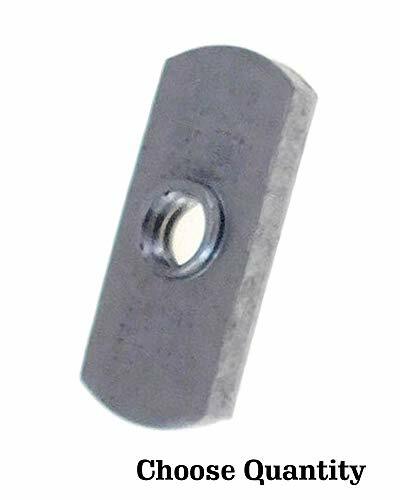 This weld nut has a narrow body that is well suited for use in confined areas. The weld nut features a strong single button projection which gives a deeper, more penetrating weld than is ordinarily obtained from other types of projections. Thread Size: M8 x 1.25mm. Made of carbon steel in dark grey, sturdy and durable. Weld nuts,designed to stand off the material to allow easy weld penetration,widely used to industrial machine. Thread Size: M10 x 1.25mm. 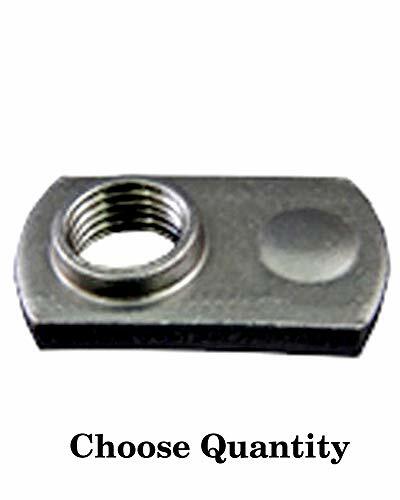 Square weld nuts,designed to stand off the material to allow easy weld penetration,widely used to industrial machine. Hex weld nuts are used for providing a threaded hole to materials too thin to tap as well as attaching a threaded hole to parts that can only be accessed from one side. The 3 projections on weld nuts melt into the host material during welding for a quick and enduring hold while the long pilot helps to ensure a precise installation without slipping off the center and protecting the threads from welding spatter during welding operations. * SODIAL is a registered trademark. ONLY Authorized seller of SODIAL can sell under SODIAL listings.Our products will enhance your experience to unparalleled inspiration. SODIAL(R) M6 Carbon Steel Slab Base T-Shaped 2 Projection Weld Nuts 25 Pcs Product Name: Weld Nuts; Grade: 4.8; Thread Size: M6 / 0.24 inch Material: Carbon Steel Main Color: Gray Height: 7mm / 0.28 inch Weight: 130g; Package Content: 25 x Weld Nuts Only the above package content, other products are not included. Note: Light shooting and different displays may cause the color of the item in the picture a little different from the real thing. The measurement allowed error is +/- 1-3cm. 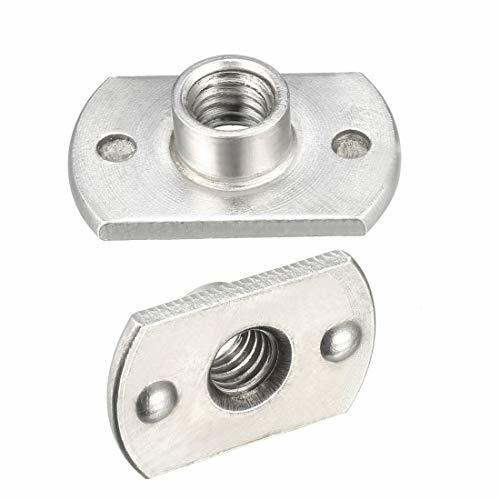 Tee weld nuts or Tee nuts are low-cost threaded anchors that offer excellent load distribution when fixed to thin sheet metal. 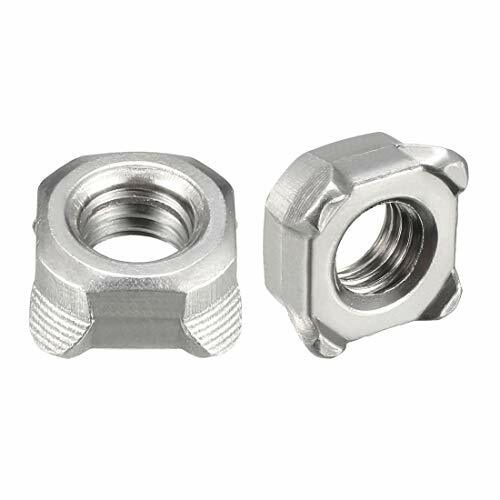 Manufactured to the highest standard these Tee Nuts are Perfect for use in the automotive, domestic appliance and light-engineering industries. Typical applications include domestic appliances, motor vehicles, steel cabinets, furniture and steel work. 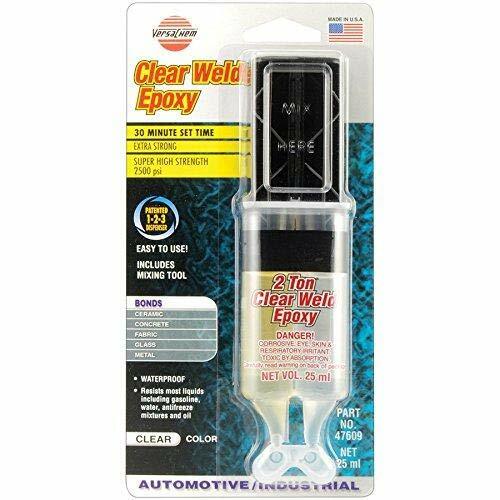 Versachem Clear Weld Epoxy is a high strength, non-shrinking epoxy specially formulated for high clarity and good impact strength. Waterproof formula is perfect for bonding or repairing metal, wood, glass, ceramic, china, concrete, fiberglass and chrome, with a tensile strength of 2500 PSI. Only mix the amount of epoxy and hardener together that can be used within the handling time. You can mix colored chalk with epoxy to repair enamel and china that has been nicked, and you can also add color pigment concentrate. This must be done after the resin and hardener are thoroughly mixed together. It is good to use removable tape on any area that you do not want epoxy to get on. Remove the tape before the epoxy cures. Temperature Range: -40F to 200F. 1/4"-20 Steel Round Base Weld Nut with Projections, 50 pk. 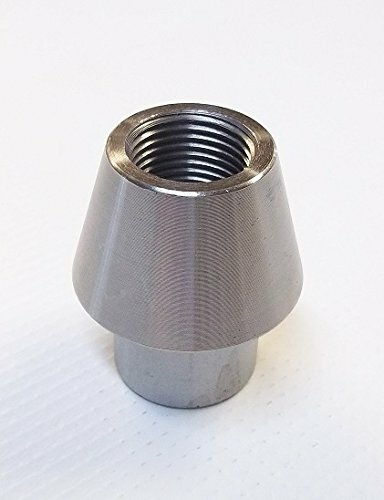 Price For: Each Item: Weld Nut Fastener Finish: Plain System of Measurement: Inch Fastener Thread Direction: Right Hand Basic Material: Steel Barrel Head Height: 7/16" Barrel Dia. 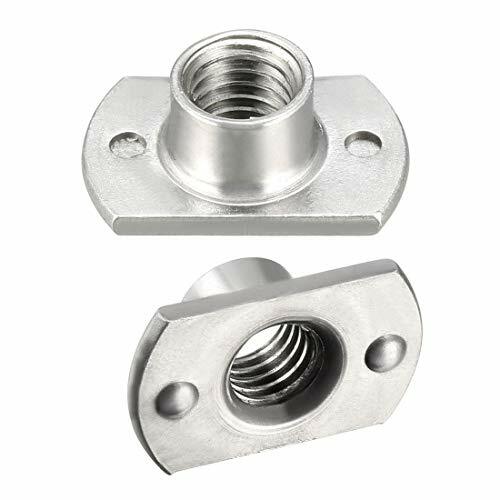 : 0.305" Dia./Thread Size: 1/4"-20 Projection Height: 0.390" Projection Width: 0.109" Weld Projections: 3 Fastener Thread Type: UNC Base Thickness: 0.047"
At Biker's Choice, they know quality, value and performance when they see it. It's not only their passion but their personal promise to provide their customers only the best products the world has to offer. They know their products like they know each other, because they ride what they sell. About US Our roots are in racing, with expertise reaching into nearly every major sanctioning body worldwide. With age comes experience and we have engineered racing solutions for the pros for more than 25 years. With headquarters in Southern California, USA, and experienced distributors all over the world, we service customers on nearly every continent. Our vision is to engineer products that not only do everything you need them to, but products so well engineered and groundbreaking that they raise the bar for everyone else in the industry. Quality We are committed to bringing you the most technically-advanced fluid delivery systems on the market. Reliable top quality products that perform consistently, even in the most extreme conditions. Our products are not only engineered to withstand the demands of modern racing engines but they're also engineered with your goals in mind- We get it, racing is not just about having fun, it's also about winning... And a win for you is a win for us. Performance & Reliability Top quality is not just necessary to take you to the next level, it's also necessary to keep you safe. Products that are made from inferior materials or that lack proper research and vigorous testing will not only decrease your chances of reaching the finish-line first, they may also decrease your chances of reaching it at all. That's why we are committed to bringing you top quality products and the performance that you can depend on, race after race.